I’ve finally come around to releasing the toolbar I use in Homesite for working with Bazaar. There might be some people still enjoying Homesite as their editor of choice, and seeking a solid VCS system, so here’s an explanation of how I work, and a link to the toolbar I created for using Bazaar from Homesite. There are a lot of well-known version control systems. Traditionally they had a central location for storing files, and a developer would “check out” a file, work on it, and check it in again, together with a description of what he (or she) did. Examples of VCS’s that work(ed) like that are Visual Sourcesafe and Subversion. This allows developers to work and commit changes to their own repository, independent of the “main” code. Whenever they see fit, they then merge these commits with the “main” code. A developer can work on a bunch of files to add new features or fix a bug, and then commit them as a single new revision. Bazaar and GIT are examples of these new DVCS versioning systems. There is an excellent explanation of the differences between traditional VCS systems and a DVCS here. I’m writing this article to give you a quickstart in using Bazaar under Windows using HomeSite. It is in no way a complete reference to Bazaar. It just explains the way I use Bazaar currently. Bazaar has numerous other usage scenarios besides the one I use. To start off, download Bazaar and Install it. I use the standalone version myself. When selecting the options for installation, make sure you have Bazaar add itself to your PATH environment variable, also make sure you install QBZR (a GUI for Bazaar). If you accept the default settings, this will automatically be done. The way I work with Bazaar is I store my source-code in a central location, I develop locally and I commit my changes to that central spot. This is in fact how traditional VCS’s work. As I mentioned, Bazaar has more scenarios to work in, but this one suits me well. I have my “main” repository on a NAS drive, and I work locally on one or more Windows machines, developing websites under IIS. I have mapped a drive letter to the directory on my NAS that has all of my different folders with sourcecode. In my case the drive letter is W:, on that disk there is a folder called “websites” and in there, there are folders for the sourcecode of all of the websites I’m developing. So now we have a directory of files and folders, and we want bazaar to keep track of any changes there. Note that it doesn’ t matter that you’re working on a networked drive, bazaar works over a networked connection aswell as locally. It can also work using SSH, FTP or HTTP connections, but that is out of the scope of this article. Back to the CMD prompt; type “bzr init” to start versioning this directory and everything in it (no pun intended). Bazaar will respond with: “Created a standalone tree (format: 2a)”. Bazaar will have created a hidden folder called .bzr where it will store its information. Unlike Subvsersion, which puts a hidden folder like this in every subfolder, this is the only folder Bazaar needs and uses. So removing versioning is as simple as throwing away this single .bzr folder. Now that this folder is in version control, we need to add the files and subfolders in it to Bazaar. We do that by typing “bzr qadd”. This will invoke a GUI tool for adding files to bazaar. By default it will try to add all new files and folders under the versioned directory. Sometimes you will want to exclude some files from being versioned (like Windows’ thumbs.db files, for example). You can do so by creating an “ignore” file, or using “bzr ignore”. The ignore file is beyond the scope of this article, but it’s easy to setup and well documented on the bazaar website. In the qadd dialog, add all of the files and folders you want bazaar to keep track of and click ok. The last thing we need to do now, is make our first commit! We have initialised the folder, added the files we need to keep track of, and now we need to tell bazaar to store this information in a commit. Type “bzr qcommit” in the cmd window and in the dialog that appears, type a description of what you’ve done. In this example we can just write “added all of the base files” or something. Bazaar will now add the changes and your message, and you have just committed revision one of your project! This is ofcourse very nice, but I want to work on this code from different computers in my house, and if it is a website, I want the code in the inetpub directory of my local IIS. Because the repository (yes, your sourcecode folder is now a repository) is in a central location, this is all possible. To accomplish this, just open a cmd prompt in the spot where you want the sourcecode folder on your local machine, say “C:\inetpub\wwwroot\”. Now type “bzr checkout W:\Websites\www.demosite.com”. Bazaar will now fetch the sourcecode from that directory on W:, copy it to the local folder and hey presto, you have a local repository. Please note that this works on a directory level, so the entire folder http://www.demosite.com is copied to c:\inetpub\wwwroot\. Keep that in mind when creating repositories. Because we used the “bzr checkout” command, instead of “bzr branch” which does something similar, bazaar now knows that your local version of http://www.demosite.com is linked to the “main” repository on W:\Websites\. That means that every time you change something in your code locally on C:, and you do a “bzr qcommit”, it will commit to the repository on W:\Websites\www.demosite.com\ as well as to c:\inetpub\wwwroot\www.demosite.com\. This means both repositories are being kept up-to-date. An advantage of bazaar is that when, for example, the NAS is out of order, or you have your laptop away from your network, you can still change code locally and add the changes to your local bazaar repository using “bzr qcommit”. There’s a checkbox in the GUI that allows you to commit locally only, when you return to your network, you can merge all of your commits again with the repository in the central location. Also, if you’re working with a team of people, all of these individual developers can do the same “bzr checkout” from the central location like we did above, and have a copy of the repository on their local machine. They can commit their changes, and these changes will also be added locally and to the central location. The only extra step involved is that you’ll have to do a “bzr update” command before you can do a commit. In a team scenario, it’s possible that one of your co-developers has added a feature and commited it to the main repository. In order to update your own (local) repository with the latest code from the main repository, use “bzr update” to update. Again, because we used “bzr checkout” to create a local repository, bazaar knows where the main repository is stored, and typing “bzr update” will fetch the latest version from that location. This way of working enables you to work in a team using a central repository of your sourcecode. bzr init – prepares a folder for version control, bazaar adds a .bzr hidden folder to store information. bzr remove [file] – remove files from version control. 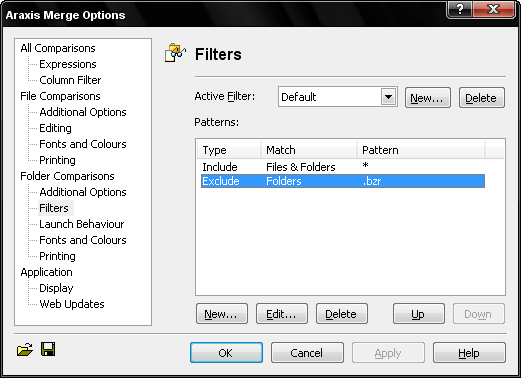 The –force option will delete these files from disk, –keep will remove them from bazaar, but not from disk. Note: deleting a file from disk using homesite or Windows explorer will mark the file as “missing” in Bazaar, use this if you want to keep the version history of the deleted file. bzr qbranch – GUI tool to create a copy repository from an existing repository, not “binding” the copy to the original, this is called a “branch”. bzr qcommit – GUI tool to commit changes to the local repository. If the local repository is bound to another repository, the other repository is also updated. bzr qannotate [file] – GUI tool for looking at a file and seeing all changes per line. First I installed a “command prompt here” menu option in the (right-click) context menu of Windows. Here is an explanation of how to do this. This option will show up in HomeSite aswell, when you right-click a folder. Windows 7 has this feature built-in when you press shift and right-click a folder, but that doesn’t work in HomeSite. I used the registry-hack from the aforementioned site, this works fne in Windows 7 aswell. I no longer need to press the shift-key and it works from HomeSite. Using this context-menu item I can easily open a command prompt to any of my website folders from Homesite, I no longer have to navigate in DOS to the correct folder. * register WSC -> this is not bazaar related, but a tool I use a lot personally in ASP development. You can easily remove this button in HomeSite. You can find the Bazaar toolbar for Homesite here. To download it, you’ll need Bazaar installed :) The instructions for using Bazaar to download code from Launchpad is here. Note that you can edit the toolbar yourself, you’re very welcome to implement things further, some buttons are just a call to one of the qbzr GUI tools, others have some more intelligence: HomeSite can use vbscript scripts to automate things, and for example, I have implemented a script that can figure out where the current root of the repository is as seen from the current open file. Let me know if you have an interesting addition so I can integrate it on Launchpad. A quick tip for those of you that want to run a classic ASP website using an access database under a 64-bit operating system; this doesn’t work out of the box. The reason is that there are no 64-bit odbc access drivers (yet). I read somewhere that Ofiice 2010 might have them, but for now, the solution is to run the application pool your website runs in, in 32-bit mode. To do that, open IIS manager, in the treeview on the left go to the application pools and select the application pool your misbehaving website runs in. The advanced settings link on the right opens a popup where you can find an option to enable 32-bit applications. Set it to TRUE, recycle the pool, and your access driver/website should work. Once in a while some new technology pops up that makes me want to experiment a little. CouchDB is one of these technologies. If you haven’t heard of CouchDB before, Matt Aimonetti has a neat presentation on it over on slideshare. Although I’m trying to find out what programming language to dive into next (python and c# being my main candidates), I’m still most proficient in classic ASP. I needed to take this one step further though, I wanted this library encapsulated in a .WSC file. If you’ve read some of my other posts, you know I use wsc’s to create objects in ASP, so the spaghetti-code argument a lot of people have against classic ASP is no longer valid. The thing with WSCs is that, unlike includes, you can conditionally use them. An include in an ASP file has a lot of overhead, because it is, by default, always included. The server includes the file, and then the ASP interpreter goes ahead and processed the page. In a WSC you can keep your code separate from your ASP pages and conditionally (I.E. in an if…then statement) load them. Anyway, let’s not get sidetracked here. Please note that the code needs a couchDB database set up somewhere. I have done this by installing it on my linux laptop and running it from there. The ASP code runs on my Windows workstation. The installation of CouchDB on Windows seems to be quite cumbersome still, so a separate machine (this could also be a virtual machine) is propably the simplest way to go at this point in time. While I’m posting video’s anyway, I thought I’d publish my favorite one too. This is a video of Matt Weddle of a band called Obadiah Parker, performing Outkast’s “Hey Ya” acoustically. It’s too bad the sound-quality isn’t great, but still… This rendition made me play the video over and over and over again. Enjoy. A video that says it all. A video that touches on the problem us developers have to face day in and day out. The message is clear. Hug a developer. Do it today. We really need it. As promised, a little update on how bazaar is working for me under Windows. As it turns out, the plans I had for implementing SVN at work are now obsolete, I liked bazaar so much, we are now using it at work as well. In the last post we saw how to create a local repository and see some changes between that and your working copy. All nice, but what if you’re not solo’ing a project? Most of the time, you’ll have a development server, maybe even a testing server available. In my case, I have a central server set up from which I run my local websites. I have a local DNS and that simplifies webdevelopment a lot. I have URL’s to all my projects I can use internally. Anyway, what you probably want, is for your server to contain the main project, work locally on that project and when you’re done editing your branch, publish it back to the server. What I did to accomplish that is to go to my server and into the WWW root. My server is setup much the same way as my workstation (see last post). In my wwwroot are all the websites I’m currenty working on, so the thing to do here is cd into one of them and use the exact same procedure as described in the last post, to create a new project. “bzr: ERROR: Not a branch: “http://%5BURL to my project]/”. I can imagine this being a showstopper for people, but I had another option to try, the FILE protocol. (I admit I haven’t sought out any help on this in the bazaar community, so if someone finds out how to use SFTP with freeSSHD under windows, leave me a message.) UPDATE: This seems to be a problem with freeSSHd, using CopSSH on Windows works! You’ll see that you have (a) modified file(s). Suppose you are happy with your changes, you can commit them (locally) into a revision. Quickly pointing my browser to http://pure.precompiled.local; and presto! My server shows me the version with the pagetitle changed. Now this is all very nice, working locally, commiting locally and then pushing to the server. But if you work with a central server there is an easier way. Type: “bzr bind w:\pure.precompiled.local” to bind your local repository to the server’s repository. What this does is make sure that any commit is done locally as well as on the central server, at the same time. So there’s no need to use “bzr push” anymore. This is the way I work now at home (solo) and at work (in a team). There is one caveat: the commit to the server doesn’t UPDATE the files on the server. So your changes are stored on the server, but the files on the server stay the way they are until you run “bzr update” locally on the server. There are a few plugins that claim to be a way around this, but for me it’s just a minor problem. I scheduled a bzr update to run every day at work so our server can be looked at by our test-team. If we need an immediate update, I run it manually, no biggie. In the meantime I made a bazaar toolbar for homesite that lets me do these things and more in a GUI directly from homesite. It’s not really polished, but when I come around to that I’m thinking of posting it on launchpad. If anyone is interested right now, leave me a message. As promised, some more info on how I’m getting along using Bazaar as my VCS of choice under windows, using homesite for classic ASP development. Let’s start with the basics, there are two possible ways of installing Bazaar under Windows; installing the version for Python, or installing a standalone .EXE with Python “built-in”. Not all plugins work with the standalone version, but I installed it anyway, because it’s an easier install. Also, it shouldn’t be too hard to uninstall the standalone version and install Python and Bazaar for Python later on, if the need arises. After installing Bazaar, you should be able to start bazaar from any command prompt. So start a command line (for example by using Start…run… and typing ‘cmd’) and type ‘bzr [ENTER]’. You should get a general explanation of Bazaar’s most used functions. If not, try rebooting. Bazaar should have added itself to your PATH environment variable. This way bzr.exe is found no matter where you type it in a DOS prompt. Sometimes it takes a reboot for Windows to see a new addition to the environment variables. If you verified that Bazaar can be started, it’s time to set up your workstation. Usually, when working with a version control system, you work on your local machine. In webdevelopment, this is a little trickier than in application development, but not a lot. The workstation version of Windows (XP pro, 2000 workstation) DOES have the irritating limitation within IIS of 10 concurrent users and only one active site at any time. For developing a website, this is usually not a problem. There are a few tools that can run in your tray and allow you to switch between sites easily. I use IISadmin.NET myself, but there are more. Using a tool like this makes developing on your local machine quite do-able. If you have installed and configured Internet Information services (IIS) on your workstation, you can go to the wwwroot (c:\inetpub\wwwroot\ by default) and create a few folders for your different projects (that’s the way I work, YMMV). Set them up in the IIS console and fill the folders with your files. This is just plain old setting up IIS, I won’t go into that, there are enough sites explaining the procedure. Now, say for example I have a site called “pure”. I have the folder “pure” created under C:\inetpub\wwwroot\ and I have added my html/asp/js/css files to it. I activated the site in Windows IIS console (set the root folder to “C:\inetpub\wwwroot\pure\”), started the site and I checked to see if it worked by going to http://localhost/. Congratulations, you are now developing locally. This will add the files in their current form into the repository. Always use the -m option to give your commit action a short description. This is version control 101; You have to know what you’ve done to any changed files, the comment after -m lets you describe what you’ve done. Now, the advantage of working on a local webserver is that you have now already published the repository! If you have the .bzr file in the root of the ‘pure’ folder, it means that it can be reached from any other location that can reach your workstation via HTTP. You’ll have to decide for yourself what the security implications are in your situation, but for me this is a plus. I have a few workstations and a server, and this allows me to quickly pull a repository from my workstations. bzr commit -m "fixed a bug"
Windows needs to be able to find the Araxis executable even if the command prompt is in an entirely different directory. Adding the folder to your PATH environment variable will do just that. To do this right-click on the computer icon on your desktop and choose ‘manage’. On the ‘advanced’ tab there’s a button ‘environment variables’. Click it and add “C:\Program Files\Araxis\Araxis Merge v6.5;” to the PATH variable under “system variables”. (Check the path, this is for MY version of Araxis Merge). Reboot or log out/in after changing the variable, or else Windows won’t pick it up. well that’s enough for one evening. I’ll post the rest of my experiences with bazaar under windows in a next post. During the last few days I’ve been looking into version control systems for use with my projects at work as well as at home. In the past I have used Microsofts Visual Sourcesafe in combination with Homesite. This works fine, create a project in Homesite, link VSS as the Source Control software and Homesite shows you what’s checked in, what’s checked out and the world is a happy place. This works because Visual Sourcesafe has an interface called SCC. Homesite supports SSC, but unfortunately not a lot of other versioning systems have an SCC interface. Ofcourse, VSS costs money, and lately there have been more than a few open source competitors gaining momentum. Looking into them I found that version control seems to be focused on linux more than on windows. Cool new systems like Bazaar, Mercurial and Git have little or no support for windows. I know my friend Tjarko over at Carlos Gallupa uses Subversion, but that needs apache, and I really feel uncomfortable installing a complete webserver for the sole purpose of hosting a repository. Bazaar and Mercurial look promising, because they are Distributed VCS’s instead of regular VCS’s like SourceSafe or Subversion. Branching is much easier in DVCS software. For an excellent explanation of the differences, look here. I’m really leaning towards Bazaar or Mercurial for that reason, especially at work, it would be nice to create branches and revisions on-the-fly. In the end I decided on Subversion at work, as we can work with a central repository there. There is a pretty painless server setup for subversion called Visual SVN server. It includes a Windows MMC tool for managing your repositories and the apache server is included and installed automagically. On the client side I found there is an SCC plugin available for subversion. So using it from Homesite and later on from Visual Studio should not be a problem. At home I decided to go the bazaar route. I think programmers should really not care about using the command line, I’m figuring it out as I go along. In a next post I’ll give you my findings and some pointers on using bazaar under windows. Having to re-install my PC at work the other day made me realize what a diversity of little tools I use to do what I do. I decided to make a list, so here goes. Still my editor of choice. For working in classic ASP nothing beats it, not even Visual Studio 2xxx (of which the new versions don’t support classic asp anymore) or dreamweaver (too much WYSIWYG). It really is too bad there’s no replacement under linux. I’ve tried different editors and none have vbscript highlighting. Propably the one that comes closest (and the one I’m using right now under linux) is Komodo Edit. (which is open source now by the way). Eclipse is a little too bloated and slow to my taste. Every webdeveloper needs a colorpicker, screenruler and screengrabber, especially in the beginning of a project when the design has to be made into XHTML/CSS. I used to have these tools seperate, and I was especially fond of screenruler. But recently I discovered toptools. It has all of these little tools in one handy free package that runs in your tray. Launchy is really one of my favorites, not especially for webdevelopment, but on the whole. It is a tool that let’s you quickly start any application in your taskbar. Pressing alt+space gives you a textbox and you can start typing the name of the program you need. It autocompletes the name, so as soon as you see the complete name, press ‘enter’ to start it. This really saves time, because you don’t need a mouse at all. Also, it ‘learns’ what programs you use more often and they come to the top of the list. The other thing it let’s you do is use special commands like “wikipedia”, pressing tab then lets you type any keywords you’d like to search for on wikipedia. It has more plugins, but I suggest you just try it out, I guarantee you will be hooked. For people that dislike terminal server or need access to linux machines, theres an alternative. FreeSSHD is a service you can install and run on a Windows machine. It gives you file transfer and a secure shell to log into from the outside. To do that from windows you can use winSCP in combination with puTTY. WinSCP gives you Secure File Copy and SFTP, which is much safer than regular FTP. PuTTY lets you log into the SSH server and gives you a command prompt. This setup has actually saved me a trip to one of my servers a few times. I used to manage a server that didn’t completely reboot after installing windows updates. It closed most running services (including Terminal Server services) and after that it gave up rebooting. The result being that I couldn’t connect to it anymore and the machine still hadn’t rebooted. After installing FreeSSHD I could still connect to the command prompt with puTTY, after the machine got stuck, and manage the server from there. By the way, another thing freeSSHD allows you to do is tunnel any service in a secure sockets layer. Inkscape is actually an open source vector program, like Illustrator, but it allows me to quickly create a flowchart or a diagram. So that’s mainly what I use it for. The files it creates are saved as SVG, so if you make use of SVG in your work, you could also use it to create SVG and integrate it in your websites. I don’t really use advanced UML tools, so for the simple stuff inkscape is great. If anyone can recommend a good UML tool (preferrable free), let me know. This is the SQL server client tool. It allows you to create, edit and query data in SQL server. Not really exiting, but I need it because almost all the database work is done in SQL server. If you’re looking for a free alternative, I can recommend mySQL, which also has nice management tools, works under windows and seems to be a pretty fast database. By the way, the upcoming version of SQL management tools (2008) has intellisense, which is very nice. At work, I’m forced to work with Outlook, which isn’t too bad, but I prefer Mozilla Thunderbird at home. Anyway, a really nice tool for searching your Outlook mail is Lookout. Originally developed by Lookoutsoft, this company was bought by Microsoft, so Microsoft could integrate it into Outlook themselves. Soon after that Microsoft brought out Windows Desktop Search, a tool that can search though all data on your local computer. However, I have tried MS desktop Search to search my Outlook e-mail and I just couldn’t get it to work. Lookout just works… It’s fast and using keywords like from: and to: you can specify exactly what mails you want to filter out. Microsoft has deleted all references to lookout on its site, but the link in the title of this chapter still seems to work. I’ve been looking long and hard for some sort of project-management tool, and for development this little gem seems to have most of the things I need. It’s open-sourced, so that’s a plus, also, it has features like prioritizing, setting due dates, assigning tasks to different people, time-tracking and the possibility to use it among a group of people. At work we have an existing web-based system for bug-tracking and ToDolist integrates with systems like this by letting you create a button and setting an ID for a task. Pressing the button launches a browser and you can set it to go to your web-based bugtracker with the ID as a parameter. Very nice, especially in a small company or for a freelancer where bugzilla or something similar might be too much. I have been working on a very large corporate web application using ASP/WSC. The application was very fast and performance was not an issue. UNTIL we updated our servers a few months ago. Performance went down 400% and IIS hung and crashed very often. The asp pages were slow and unresponsive. We have been working our butts of to solve the problem, de-installing servicepacks for windows and sql server and in the end re-installing complete servers. We noticed the difference in the end when we had one IIS server that was fast and had a few updates that another IIS server missed. Although we are not 100% sure which one of these updates breaks classic asp (or at least cripples it), we are fairly sure it is the new vbscript.dll 5.7 distributed with IE7. I also am not sure if this problem only arises when you use WSC’s in your ASP code or if it is a generic problem in classic asp. Anyway, removing these four updates resulted in our asp / wsc application accelerating back to the performance we were used to and to the crashes in IIS stopping. So please if you use classic asp, be careful to install IE7 on your IIS server. At least check performance levels. Hope this message helps anyone struggling with the same problem, as we were unable to find any leads towards a solution. I’d also like to hear if any other people are running into these problems and can verify the solution. Specifically, I am curious if this problem only happens on asp using WSC objects, or if it also happens on classic asp websites without the use of WSC.